Go beyond BlackBerry basics and get everything your BlackBerry can deliver BlackBerry is the leading smartphone for business users, and its popularity continues to explode. When you discover the amazing array of BlackBerry possibilities in this fun and friendly guide, you'll be even happier with your choice of smartphones. 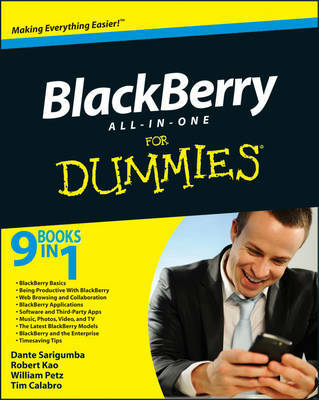 BlackBerry All-in-One For Dummies explores every feature and application common to all BlackBerry devices. It explains the topics in depth, with tips, tricks, workarounds, and includes detailed information about cool new third-party applications, accessories, and downloads that can't be missed. * With several models available, the BlackBerry is the most popular smartphone for business users and that market continues to grow * This guide covers the basics common to all models and explores individual features in depth * Examines social networking applications, navigation, organizing contacts and the calendar, and synchronization issues * Delves into multimedia, including e-mail, photos, and the media player * Explores GPS, the internet and connectivity, great downloads, how to maximize third-party applications, and application development * Uses graphs, tables, and images to fully explain the features of each model * Author team is directly involved with BlackBerry application development BlackBerry All-in-One For Dummies helps you take full advantage of everything your BlackBerry device can do for you.